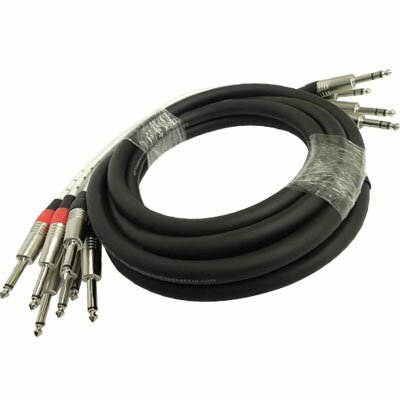 4 Channel Insert Snake 4 TS to 8 TRS 15 Feet - Model # SAST-4-8-15, Insert Snake, 15 feet from tip to tip, Channels: 4 1/4" TRS x 8 1/4" TS, Conductor: 22ga high purity copper, Color coded, Numerically labeled, This snake cable is brand new, One year warranty. This Snake is configured with 4 1/4" TRS send/return ends on one fantail broke-out to 8 1/4" TS (12 sends and 12 returns). The 1/4" TRS ends are broken into separate 1/4" TS sends & returns. Uses include, but are not limited to: Insert graphs & effects into boards that have 1/4" TRS sends & returns where the send is on the sleeve or tip, & the return is on the visa-versa portion of the TRS connector. View More In Recording Snakes.